OTTAWA — Carey Price gave the Montreal Canadiens a chance to win, and P.K. Subban seized the opportunity on behalf of his overworked goalie. Subban scored 23 seconds into overtime and Price stopped 40 of 44 shots to give Montreal a wild 5-4 victory against the Ottawa Senators on Thursday. Subban beat Craig Anderson on the only shot in overtime in a game that saw the Canadiens jump out to a 3-0 lead in the first period, only to give up four unanswered goals while being outshot 38-17 in the first two periods. Price made a number of sensational saves in the second to protect Montreal’s 3-2 lead before he was beaten on Ottawa’s final two shots of the period. Bobby Ryan and Kyle Turris scored on the Senators’ 18th and 19th shots of the second period to give Ottawa its first lead at 4-3. The Canadiens recovered in the third, and Tomas Plekanec tied it 4-4 when he got credit for his second goal of the game with 8:58 remaining. Plekanec, who opened the scoring with a shorthanded goal at 2:04 of the first period, drove in on a breakaway and was stopped by Anderson, but the rebound went into the net off the skate of Ottawa defenseman Jared Cowen. Erik Karlsson had a goal and two assists, and Clarke MacArthur had a goal and an assist for the Senators, who defeated the Canadiens in the first round of the 2013 Stanley Cup Playoffs and won the first two games between the teams this season. 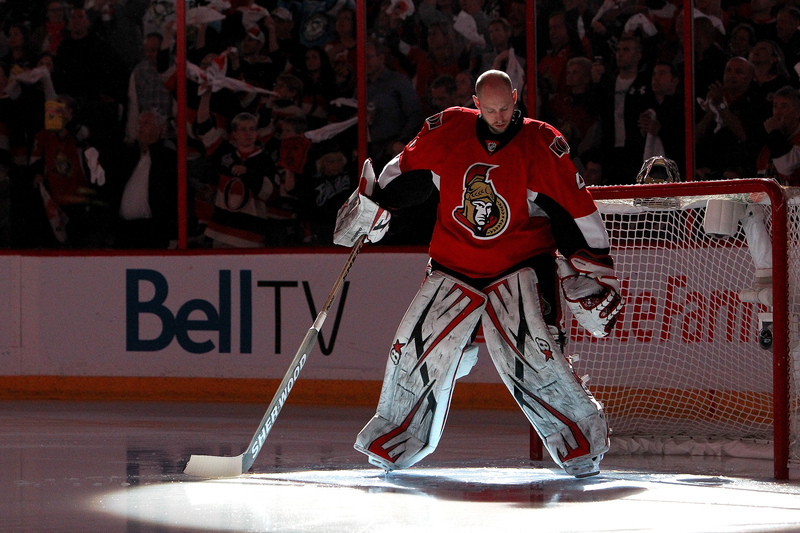 Ottawa coach Paul MacLean was not about to lay the blame on Anderson, who made 18 saves. Price, who will represent Canada at the 2014 Sochi Olympics, made a spectacular glove save on Milan Michalek’s shot from the slot, the Senators’ 30th of the game, at 9:06 of the second period. Price stuck out his left pad to steal a sure goal from Ryan later in the period before making another glove grab to deny Mark Stone at 15:02. Ryan broke through to tie it 3-3 with his team-leading 19th goal at 17:16. Turris gave the Senators their first lead at 18:40 when he took a return pass from MacArthur and beat Price with a backhand for his 14th goal. “This is one of those games that brings out a huge range of emotions,” Ryan said. “You get down when you think you’re dominating for the most part, then you come back and show that resiliency to compete for that point in overtime, and then you blow a lead and you lose and you don’t get to the shootout. Plekanec, who will captain the Czech Republic at the Olympics, fell to the ice after he was struck on the right leg by a shot by Ottawa’s Cory Conacher midway through the first period. Plekanec went to the dressing room briefly before returning. Max Pacioretty made it 2-0 for Montreal with his team-leading 21st goal on a power play at 14:05. David Desharnais, who missed the Canadiens’ 4-1 loss to the New Jersey Devils on Tuesday because of the flu, scored at 15:36 to increase Montreal’s lead to three. Ottawa scored two goals 1:12 apart late in the first to draw to within 3-2. MacArthur scored his 17th goal at 17:13. Karlsson was left unmarked to score into a wide-open net at 18:25, his 11th.